Guru Guru - "2000 Gurus"
Mani Neumeier has taken me for a loop... literally! The modern version of Mani's Guru Guru clan has met the new millenium with a brand new approach. Are you kidding me - electronic drums and programmed loops? Yep, it's true. '2000 Gurus' bears no resemblance to the recent 2LP 'Live 98,' where Mani reunited with some old friends (including Ax Genrich, and members of Can) and put forth some great old-style psychedelia. Here, he calls on loopmaster Vichy Ratey, and chooses a modern blend of electronica and traditional eastern music. The inside cover photo showing the Starship Enterprise flying over Buddhist (or Hindu, I'm not sure) temples perfectly depicts what lies in the adjoining plastic tray. I really shouldn't be so surprised though. The Amon Düül II reunion album 'Nada Moonshine #,' recent Ashra albums, and Harold Groskopf's 'Sunya Beat' all offered similar mixtures of tradition and technology. While the opening two tracks have a bit too much 'electronica' for my tastes, I still found some things to my liking. The elephant guitar effects and Roland Schaeffer's nasally sax on "2000 Gurus (All later)," plus the gurgly, swirly sounds of "Galactic Human" are intriguing, but then the fakey e-snare sounds leave a bad taste in my mouth. Things improve in a hurry though, as "Tribes and Vibes" (great title) is a winner, Schaeffer's alto sax carrying the melody against multiple layers of percussion (mostly acoustic I think). An upbeat and fun piece. The sultry "Nightbirds" recalls the suave stylings of Bryan Ferry, another unanticipated turn to say the least. Sky Cries Mary does this style better, but it still deserves a thumbs up. "Marabut" is a traditional Indian piece, not exactly a 'raga,' but tablas and chants abound. My favorite pieces are at the end - Mani's breathy vocals, guest Hans Reffert's delay guitar, and the obligatory loop of "Das Glück" make this one sound very much like Columbus' own Quarkspace. "Blue Space" is rather similar, a nine-minute groovy space-jazz number that could have found a home on Gong's latest effort. In other words, *none* of this album sounds like Guru Guru! Despite its incongruous nature, I found '2000 Gurus' to be engaging and fearless. Not all of it came up roses, but better that than a safe and unchallanging attempt. Who says you can't teach an old dog new tricks? Mani Neumeier is one of the great characters of the classic krautrock era, and I'm glad to see him just as vital and productive again. 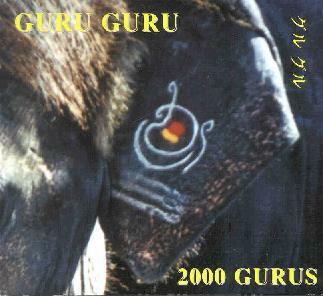 I'm anxious for another CD; '2000 Gurus' is a mere 42 minutes, I'm sure he's got more yet to give. 2000 Gurus is released by Fünfundvierzig, Schmiedetwiete 6, 23898 Labenz, Germany. It is distributed in the US by InnerSPACE Records. You can visit their web site. Contact via snail mail at InnerSPACE Records; PO Box 411241, San Francisco, CA 94141-1241.